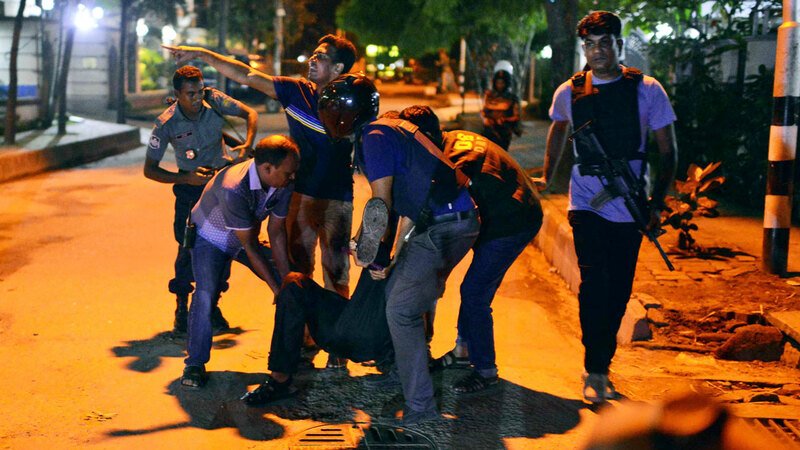 People help an unidentified injured person after a group of gunmen attacked a restaurant popular with foreigners in a diplomatic zone of Dhaka. DHAKA, Bangladesh -- Emory University says two of its students were among 20 victims of an extremist attack in Bangladesh. The confirmation brings the American death tally to three, after a University of California-Berkeley student was also counted among the dead. The Islamic State group claimed responsibility for the attack in Bangladesh on Saturday, saying it targeted foreigners. Emory University president James Wagner said in emails to employees that Faraaz Hossain and Abinta Kabir were killed after militants took hostages at a restaurant in the South Asian nation's capital of Dhaka and engaged in a 10-hour standoff ending Saturday morning. Kabir was a student at the school's campus in Oxford. She was visiting family and friends in Bangladesh when she was taken hostage and killed. Hossain had completed his second year at Oxford and was headed to the business school in the fall. School spokeswoman Elaine Justice says Kabir was from Miami, Florida, and Hossain was from Dhaka. Bangladeshi forces stormed an upscale Dhaka restaurant to end a hostage-taking by heavily armed militants early Saturday, killing six of the attackers and rescuing 13 captives including foreigners. The military said 20 hostages were killed during the 10-hour standoff, and a survivor's father said the attackers spared people who could recite verses from the Quran. Italian foreign minister Paolo Gentiloni said nine Italians were killed, and India's government confirmed an Indian woman was killed. The overall toll of 28 dead included two police officers who were killed at the start of the attack. The hostage-taking marked a sharp escalation of the militant violence that has hit the traditionally moderate Muslim-majority nation with increasing frequency in recent months. Previous attacks involved machete-wielding men singling out individual activists, foreigners and religious minorities. About 35 people were taken hostage Friday night when gunmen stormed the popular Holey Artisan Bakery in Dhaka's Gulshan area, a diplomatic zone, during the Ramadan holy month. Paramilitary troops who mounted the rescue operations in the morning killed six attackers and recovered explosive devices and sharp weapons from the scene, Brig. Gen. Nayeem Ashfaq Chowdhury said. He did not identify the hostages. In Rome, Gentiloni said the bodies of nine Italians have been identified among the dead. There was another, unidentified body in the military morgue of Bangladesh, but its nationality had not been determined, Gentiloni told reporters Saturday. Italian news reports had said about 10 Italians were inside the restaurant when it was attacked by militants on Friday night. Japan's government said a Japanese hostage was rescued with a gunshot wound but seven others are unaccounted for. Deputy Chief Cabinet Secretary Koichi Hagiuda said the eight were together at the restaurant during the attack. Prime Minister Shinzo Abe told reporters in Tokyo the situation for the others was "dire." India's External Affairs Minister Sushma Swaraj confirmed that a young Indian woman was among those killed in the attack. "Extremely pained to share that the terrorists have killed Tarushi, an Indian girl who was taken hostage in the terror attack in Dhaka," Swaraj tweeted, adding that she had spoken with the girl's father. Indian officials said Tarushi Jain, 18, was a student at University of California, Berkeley, who was visiting her businessman father in Bangladesh. Two Sri Lankans also were rescued, said Lt. Col. Tuhin Mohammad Masud, commander of the Rapid Action Battalion that conducted the rescue operations. The attack came during Ramadan, when devout Muslims fast during the day and eat after dark. Another survivor said the gunmen ordered bakery workers to switch off the lights in the restaurant. The militants then covered close-circuit cameras with black cloth. The bakery worker, who was not identified, told ATN News, a Bangladesh television channel, that when the first attacker entered the gate he thought it was someone taking shelter in the restaurant's doorway. "Then I saw that he had weapons. On seeing that, I ran toward the back of the restaurant. He fired while I was running but I was not sure if he was targeting me because I did not look back," the survivor said. He said he ran and told everyone working inside the bakery, and many people ran out using the back door. "Those who could not hear me, or understand me, did not leave because this happened in a short span of time," he said. Police said the two officers died at a hospital after being wounded in the initial gunfire. Ten of 26 people, who were wounded when the militants opened fire, were in critical condition, and six were on life support, according to hospital staff. The injuries ranged from broken bones to gunshot wounds. Only one civilian was among the wounded. The government did not directly comment on the IS claim of responsibility but has denied in the past that the extremist group based in Syria and Iraq has a presence in Bangladesh, instead blaming the recent attacks on its political enemies. Hasina's government has cracked down on domestic radical Islamists by making scores of arrests. It has accused local terrorists and opposition political parties - especially the main opposition Bangladesh Nationalist Party and its Islamist ally Jamaat-e-Islami - of orchestrating the violence in order to destabilize the nation, which both parties deny. Associated Press writers Katy Daigle in New Delhi, Matthew Pennington in Washington and Ken Moritsugu in Tokyo contributed to this report.